Specially designed agitator gently and efficiently mechanically opens hop cones to accurately and quickly extract the hop aromas located in the lupulin glands at the leaf bases. This allows aroma extraction to be substantially independent of isomerization, making delicate and refined “late-hopping aromas” possible. Hop savings of up to 30% possible! 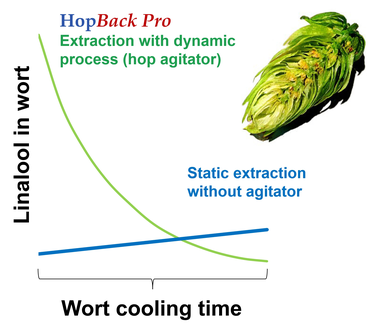 The HopBack acts as a pre-filter when late hopping with pellets, reducing wort loss in the whirpool.